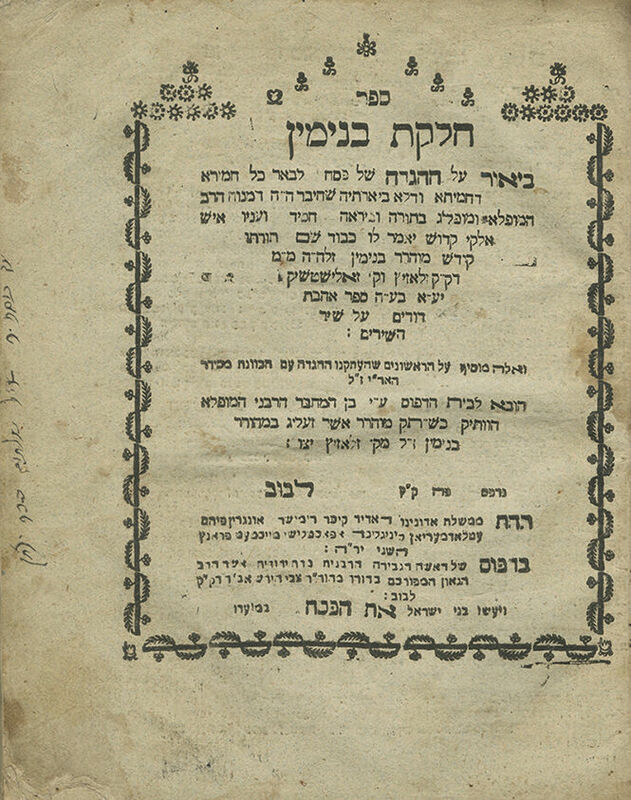 Chelkat Binyamin, Passover Haggadah with kavanot of the Arizal and the Chelkat Binyamin commentary by Rebbe Binyamin, maggid of Zalozitz (Zaliztsi) and Zalishchik (Zalishchyky). Lviv: Rebbetzin Yehudit [Rosanes], . First edition of the first Chassidic Haggadah to be printed. Approbation by R. Levi Yitzchak of Berditchev, who acclaims the composition as capable of "bringing many to repentance", and extols the virtues of the author: "…by this righteous and G-dly man, the late R. Binyamin who served as maggid of Zalozitz… and I saw several thoughts which were delightful, whether in revealed or hidden realms of the Torah, all are equally worthy, it is therefore fitting to publish it, so that its flavor and fragrance may spread afar, to bring many to repentance…". The author, R. Binyamin, maggid of Zalozitz (d. 1791), was a leading disciple of the Maggid of Mezeritch and R. Yechiel Michel of Zlotchov. He was proficient both in revealed and hidden realms of the Torah, and was one of the main disseminators of Chassidic writings, in the early years of the Chassidic movement. His compositions include: Ahavat Dodim – commentary to Shir HaShirim; Torei Zahav – on the Torah, Megillot Eicha and Esther; Amtachat Binyamin – on Megillat Kohelet. Following his demise, his son R. Asher Zelig published all his works. This commentary to the Haggadah is based on kabbalistic and Chassidic teachings, and quotes Torah thoughts from early Chassidic masters in several places. On the title page (both sides), ownership inscriptions in Sephardic script of Shlomo son of R. Yitzchak. On pp. 11b and 26a, two lengthy glosses in Sephardic script. Both glosses begin with: "So said Ch. Uziel". The first gloss contains kabbalistic thoughts. , 25,  leaves. 21.5 cm. Thick paper. Good-fair condition. Stains. Wine and food stains to approx. 4 leaves. Light worming to title page and four subsequent leaves. Marginal damage and tears to first leaves, not affecting text. Dark stains and damage to inner margins of several leaves, resulting from the leaves adhering to each other. Leaves trimmed close to page headings in several places (with slight damage). New leather binding. Stefansky Chassidut, no. 156; Yaari 253; Otzar HaHaggadot 373.